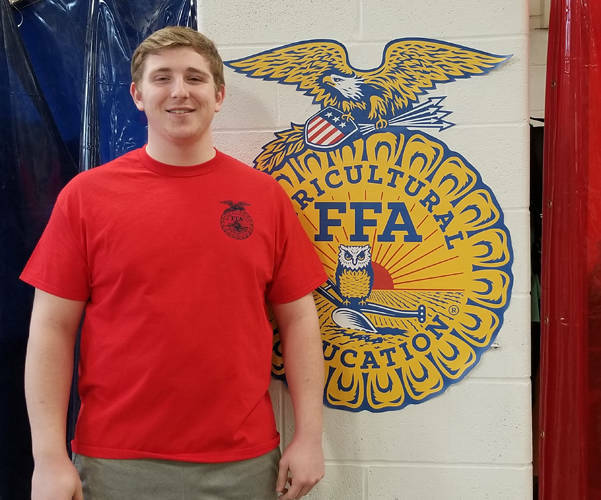 DJ Howell has been named the Mississinawa Valley MVCTC FFA chapter January member of the month. UNION CITY – Mississinawa Valley’s MVCTC FFA chapter recognized DJ Howell as January’s member of the month. Howell is the son of Dougie and Becky Howell. He is a senior and is a five-year FFA member. Throughout the years, Howell has participated in the chapter’s fruit sale, Fall Fair with egg exhibits, the King’s Island incentive trip, Farm Business Management, exhibited at Darke County Fair and even had perfect attendance at FFA meetings. In addition, he has pigs and laying hens. Howell has plans to go to Sinclair Community College for business with a long-term goal of being an accountant. Along with all of the other activities Howell participates in, he also has played basketball for four consecutive years. Lastly, he has had perfect attendance at school since his seventh grade year.